If you have the right blend creative and logical and mathematical spices, Big Data is your way to go! And, if you are wondering where to start, this is a small guide for your rescue. A list of the top technologies that are ruling the Big Data world today is all you need to nudge yourself to learn and excel in the most-wanted professional field of this day. Every Big Data enthusiast and influencer will agree that these technologies, tools, methodologies, and languages are a must to get your hands dirty with, for a successful and bright career in Big Data. •	The Hadoop Ecosystem – It is not even important to ask, why! 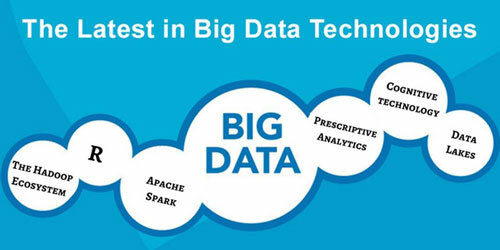 If its' Big Data, its Hadoop, well, for starters at least. While Apache Hadoop has been left behind in dominance in the market, it is still an imperative piece of the puzzle. This open-source framework to process humongous amounts of data is worth the mention as the first one. It was only last year that Forrester predicted that one hundred percent of companies would adopt Hadoop and its Ecosystem for conducting Analytics within the next two years. The main Hadoop vendors like Hortonworks, Cloudera, and MapR are all offering services that support the technology. •	Cognitive technology – Since we are talking about the technology+tools area, this one deserves a mention. Cognitive Technology takes care of tasks that are concerned with the Human Intelligence and demand concentration. This technology will help humans automate activities like writing and facial recognition, opening the window of newer and more advanced solutions to the problems of day-to-day life. Aspects of human intelligence like conceptualizing, recalling, reasoning, memorizing, and learning, will all be taken care of by this facet of Technology. •	Apache Spark – The most crucial piece of the Hadoop Ecosystem that now has recognition of its own is Apache Spark. Its popularity is ever-increasing and it has become difficult for organizations to ignore it. The general engine for processing Big Data within Hadoop, Apache Spark is proven to be a hundred percent faster than Hadoop's standard engine, MapReduce. Organizations are embracing it, and you should learn it now! •	Prescriptive Analytics – This is the area that takes into account both descriptive and predictive analytics and determines the right set of activities to undertake in a given situation. The process essentially involves the correct mix of mathematics, experimentation, and analytics to help businesses boil down to a proper decision with logic. Businesses can use Prescriptive Analytics to better their customers' experience and optimize their production if they use to its complete potential. •	R – R is another open-source project that has gained much traction recently. The software programming environment is basically designed to work with statistics. Organizations that rank languages according to their usability have dubbed R to be one of the most useful ones. For a language that is used almost exclusively for Big Data and Analytics, R is a clear winner with its data visualization capabilities. R is the choice, the only choice at times, of Data science enthusiasts and learners. •	Data Lakes – For Organizations to easily store and access their data, Data Lakes are being set up. These data repositories collect data from many sources and store it as it was. Data Lakes differ from Data Warehouses in that the latter also collects data from various sources, but processes and structures it for storage. According to a recent report, companies are looking for alternatives of Data Lakes that can combine the HDFS (Hadoop Distributed File System) infrastructure, relational and non-relational stores, event stream processing, and other technologies. Data Lakes are more of use when organizations want to store their data when they do not know yet what to do with it. •	NoSQL Databases – Its specialization in storing unstructured data and enabling a fast performance have made NoSQL database technologies a hit. Popular NoSQL databases include the likes of Redis, MongoDB, Couchbase, Cassandra, etc. The NoSQL market is predicted to grow to $4.2 billions by 2020, according to Allied Market Research. These top tools and Technologies point to one fact collectively, that Big Data Solutions Provider and its applications are on the rise and won't get subdued ever!